Ever find yourself wanting to stay motivated, but struggling with the sheer amount of work that needs to be done as you reach for your third cup of triple espresso? Your heart and body are ready to run fifteen marathons, but your brain is… still tired. What gives, and how do you keep your energy and momentum vibrant with a little less caffeine? As often happens, answers come to me through athletics. If it’s further than 800 meters, it better have some good food at the end of the run. A mile was pushing it, and I had every physical pain associated with running you’ve probably ever heard … my knees, hips, hamstrings, lower back … you name it, I felt it. And then, I finished that 3.5-mile run and wondered quietly—what else is possible? A year or so later, I got a request to run the Baltimore marathon as a part of a four-person relay. Before I could think too much, I agreed, and then I finished the darn thing. The event was inspiring and left me wondering what else I could do. Could I finish a full marathon? I wondered, out loud this time. “You just need to train,” my teammate suggested almost as if a fleeting thought. Train? That means I have to run dozens of miles every week in order to run one marathon. Is there food at the end? I put it out of my mind. Then I heard that word inside my head again—Impossible. This time the thought irritated me, and so I made the commitment to finish one before I turn forty, which is this year. I now have to run—often, and without gobs of people cheering, or fun food at the end. 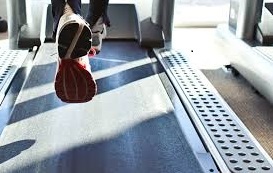 Even worse—when the weather is too cold, I have to train on a treadmill. There I was—gobs of work (miles to put in) and very little juice… motivation, excitement, you name it. I knew what needed to be done to be ready for a marathon, but … on a treadmill, by myself. Triple espresso, please? So I get myself to the gym on a Sunday morning and start running. Less than ten minutes into what I had decided would be a thirty-minute run, Sindee, my Crossfit buddy, jumped on the bike close by. 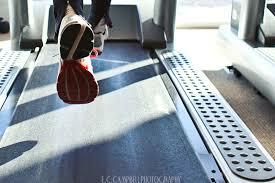 I was struggling and completely irritated that I had to run on a treadmill. Least I could do is be outside if I’ve gotta run, I lamented, thankfully to myself. Then, the words inspiration from Misti hit my consciousness again. “I’ve got twenty minutes,” Sindee said. “Seems like we’re on the same timeframe,” I suggested. Math has never been my strong suit. Thankfully, because suddenly I had the extra umph I needed to up my own ante. With that, I increased my speed. Sindee followed suit, increasing her speed—“I’m with you,” she said, effectively boosting my energy. Nearing the four-mile mark, I decided to push for six. “Just two more miles to go,” I said, thinking she’d bail, and then I could do the same soon after. Math not being her strong suit either, she upped her ante, increasing her intensity right alongside me. A half-mile later, I was tanked. I had to slow down, thinking I’d ramp it back up for the last mile. “How you doing over there?” I called out, ready for her to let me know she was done. Oh man, she’s really staying with me to the end! “You got it,” I said, ramping my speed up by .5, which I held for all of a half mile before I had to bring it back down again. “I’ll put all I’ve got into the last mile,” I said, recognizing she was now well over the timeframe she’d originally committed to supporting me through. “There is no way I would have been able to run that distance at that speed without you today, Sindee. Thank you!” I said, catching my breath. Often, recognizing the potential impact you have on another person is all you need to keep focused and progressing. By remaining focused on giving your very best while cheering others on, you cannot help but keep your energy high. Turns out, inspiring others is much easier than motivating them—and, seeing them push a little harder cannot help but keep you focused and inspired to keep moving forward. Those who are also in need of some extra umph will naturally be inspired to up their own game. The beauty in this process is recognizing that people are always watching, and nearly everyone needs a bit of umph from time to time. By showing up and staying focused as you progress toward your goals, you cannot help but inspires others along the way.